As a rule, most start-ups are short on cash and want to spend as little money as possible to give their business enough runway to take off. But there are some times that it doesn’t make sense to bootstrap because it may do more harm than good. Here are the five places to spend money on your start-up to give you a better chance at success. 1) Get a good bookkeeper or accountant. This piece of advice doesn’t apply if you are a bookkeeper or accountant, but I am not. Having a good bookkeeper is worth every penny. I love – no, I adore – my bookkeeper. Not only is she helpful in getting my budgets together, paying all my bills and cutting checks to all my contractor’s, but because of her past experience, she also has been able to help me with a number of other start-up issues, such as opening a bank account, wiring money overseas, setting up an LLC, registering a DBA, and a number of other business issues that it would have taken me hours to figure out how to do without her. Some people are able to find this experience and expertise elsewhere – with a business partner or advisor, for example – but it’s incredibly valuable to have someone on your team that has done the paperwork before. It will save you hours of work and will keep you from making costly mistakes. 2) Hire a great lawyer. Do not try to save money on a lawyer. A great lawyer will keep you out of trouble and out of court (which kills a lot of start-ups before they can ever gain traction). A lawyer will also help you when it’s time to raise money or sell your business. Spend money here – it may seem like a waste or too big of an investment, but it’s well worth the cash. 3) Hire employees with special skills and experience. Stick with contractors vs. full-time employees as long as possible, but when you are hiring, it’s worth a little extra money to get someone who has the special skills and experience that you need. For example, I need a series of reports written in SQL Reporting Services. This is a customized list of reports, I know someone who has written these types of reports in the past, and I am going to hire her to do it for me again, even though it might cost me a little more than a rookie SQL programmer. I am willing to pay her extra because I know that she is good, and she won’t have to spend a lot of time making mistakes and fixing them (because she’s already made her mistakes in the past). Chris hired someone to handle his company’s regulatory issues with the FDA – and he spent a little bit more to get someone who had previous experience working with that particular government agency, which just might help get their products through the FDA pipeline a little more quickly. Plus, the inside knowledge of how the organization works will save them hours of time in preparing documents and submissions. 4) Splurge on occasional perks that make a difference. Sometimes small splurges can make a huge difference in the company’s culture, and are worth every penny. For me, that means something as small as taking people out to dinner (with their families and significant others) to celebrate whenever we hit a big milestone, to thank them and to mark the occasion. Chris’ company, at a recent conference in Jamaica, instead of getting each employee an individual hotel room, rented a villa (for just a bit more money) that came with a private cook, housekeeper and butler. The experience that we had on that trip far exceeded what it would have been if we didn’t have authentic, home-cooked Jamaican breakfast every morning. The extra cost was worth every penny. 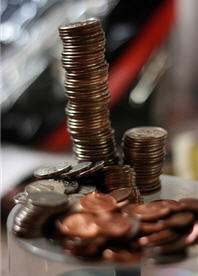 5) Spend when it will accelerate the business. The first four months of my start-up, all my Web sites were running on a hosted server that cost about $40/month. Low-cost, low-bandwidth – and I didn’t need anything more than that. Shortly, I will be rolling out a Web application that will need a more robust server environment, so I splurged on getting my new servers set up well ahead of time. I started paying for the servers in January (I likely won’t be using them full-power until March), but having the extra time to set up and test and move all my existing sites will allow my business to hit the ground running when the application is finally delivered. Eventually, even after a combination of saving and spending, start-ups often get low on money and need to look for additional funding. Next week, I’ll talk a bit about where start-ups can get cash, and the pros and cons of each option. All of the quotes in this article are from the wonderful book Founders at Work: Stories of Startup’s Early Days, by Jessica Livingston. 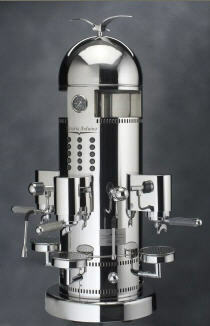 Victoria Arduino Venus Century Espresso Machine, $19,932.00.